Bharat Forge is a Pune based manufacturer of forged and machined – engine & chassis components. It is the largest exporter of automotive forgings and chassis components from India. It is the second largest in the world, after ThyssenKrupp of Germany. Manufacturing facilities are spread across 11 locations and 5 countries – four in India, three in Germany, one each in Sweden, USA and two in China. The company manufactures a wide range of safety and critical components for passenger cars, SUV’s, light, medium & heavy commercial vehicles, tractors and diesel engines. The company also manufactures specialized components for the aerospace, power, energy, oil & gas, rail & marine, mining & construction equipment, and other industries. Parts are made of steel and aluminium. Business growth has been steady over the last 7 years. The fall from end 2008 to end 2009 due to a global slowdown, and this has been followed by a rapid recovery thereafter. Pre- 2004, Bharat Forge was focused on increasing capacity and the Pune facility became the largest single forging and casting plant. Fig 1 – In Sept 2010, Bharat Forge achieved all time high revenues of Rs 719 crores, signaling full recovery. Till 2006 Bharat Forge was primarily an auto components firm. The auto demand collapse and forward looking corporate de-risking plans saw the firm fast track entry into other verticals in the period from 2006 to date. Internal targets are to double non-automotive business from 20% in 2008 to 40% by 2012. The fall in auto demand in 2007-09 saw cost cutting measures rolled out to ensure a lower break even for these facilities. Capacity utilization was 53% in 2009. This has improved to 70% for the standalone entity and 45% for international entities in 2010. From here all improved utilization will contribute significantly to profitability. We do not anticipate a need for auto capacity increase for several years. As a result of these business initiatives, when the market began to revive in 2009 for auto industry, Bharat Forge has been best placed to take advantage of this trend. Demand is increasing from both domestic business – Commercial Vehicles and Passenger cars, as well as international – UK and USA. Demand growth is led by India and China, and developed economies have stabilized and are expected to slowly recover in terms of business volumes. 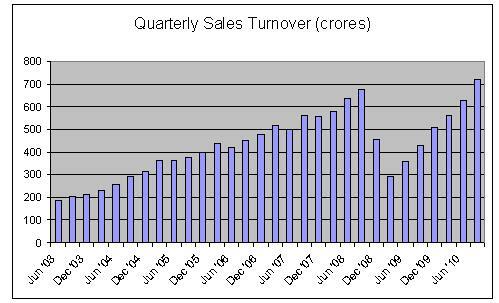 The Society of Indian Automobile Manufacturers (SIAM) releasing the 2010 sales growth data of 14.82 million units as against 11.32 million units registered in 2009. Sales of passenger vehicles segment grew by 31.34 percent, commercial vehicles segment by 45.24 percent, three-wheelers by 22.03 percent and two-wheelers by 30.51 percent. They said that the growth was due to increasing dispensable incomes, low interest rates and increase in sales base at par with the pre-recession era. India is emerging as a small car-manufacturing hub, with a number of new entrants and a slew of product launches. The luxury market too has grown rapidly. As the market matures, mid sized sedan volumes too will grow. Bharat Forge is a supplier to virtually all the auto manufacturers in India as OEM. 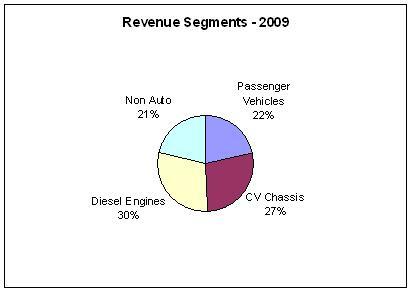 Demand for Bharat Forge’s auto components is a derived demand – dependant upon the Auto manufacturers for sales. The India domestic auto market is doing well with many auto models having a ‘waiting period’ of 2-4 months for delivery after booking by the consumer. 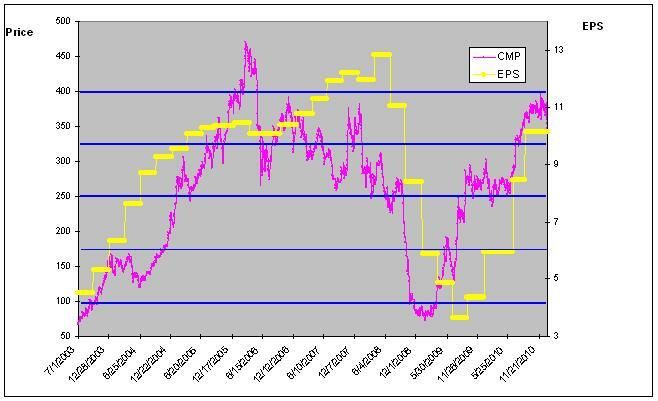 The chart (Fig 3) plots the market price (adjusted) against EPS (adjusted) over a 7-year period. The PE of Bharat Forge (Fig 4) has been at high levels of late – rising to as high as 80 times. However if you see this in the light of the short-term squeeze in business environment, this is a passing phase. The Business environment and demand situation has now become very positive. Bharat Forge is well placed to take advantage of surging demand due to sufficient spare capacities, low cost production facilities, global presence and nimble design and manufacturing capabilities. Also a series of well timed entries into new non-automotive markets. We expect EPS to continue recovery and move to all time highs. This will be followed by stock price also moving into new highs territory. Net Cash From Operating Activities has shown a positive trend, barring FY 2009. Fig 3 – Current PE looks high but seen in the context of a rapidly increasing EPS, improving capacity utilization and positive business outlook, it will soon settle to lower levels. 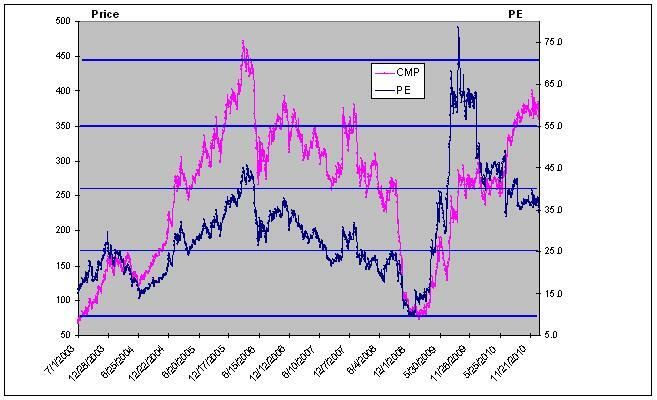 Fig 4 – Adjusted EPS has retraced rapidly and is nearing the 2008 peak. We expect the stock to appreciate to Market Price of 700 in 18 months. This is an excellent entry point for this stock as it is currently underpriced and ‘out of favour’. The the next 2-3 quarterly results will be positive and the share price may start to reflect it’s true worth. Higher raw-material costs like steel and power may restrict margin expansion and EPS growth. Low cost domestic capacity may get exhausted, requiring additional capital investments. Business complexity has increased due to addition of a number of new verticals. Management bandwidth and Vertical/ Technical skill-sets need to be upgraded to meet the business challenges. New subsidiaries and JVs need to rapidly add capacity and win deals – early stage of new businesses are uncertain and need management attention before business stabilizes. i somewhat agree with this report. though the targets seem to be stretched it all depends on what the overseas subsidiaries do in the coming 6 quarters…..if they do well…well yes! but bharat forge will certainly outperform the sensex. Report is very good. I know clsoely this company & have been tracking its growth. It is definetly on positive growth path. Should touch 1000 by next 18 months. And risk part is manpower. Managment bandwidht is a serious issue. All growth story is surrounding Mr Baba.